You’ve destroyed your Book of Faces, you’ve hit the gym, now it’s time to lawyer up. 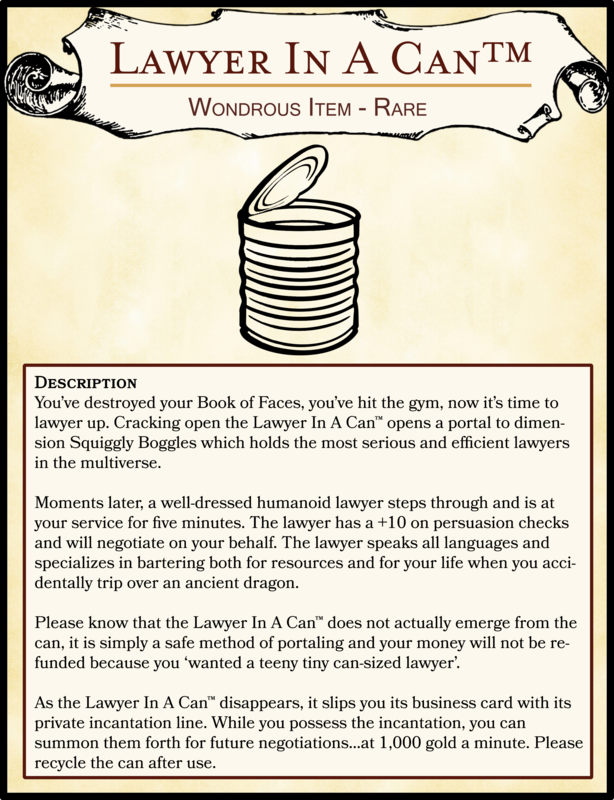 Cracking open the Lawyer In A Can™ opens a portal to dimension Squiggly Boggles which holds the most serious and efficient lawyers in the multiverse. Moments later, a well-dressed humanoid lawyer steps through and is at your service for five minutes. The lawyer has a +10 on persuasion checks and will negotiate on your behalf. The lawyer speaks all languages and specializes in bartering both for resources and for your life when you accidentally trip over an ancient dragon. Please know that the Lawyer In A Can™ does not actually emerge from the can, it is simply a safe method of portaling and your money will not be refunded because you ‘wanted a teeny tiny can-sized lawyer’. As the Lawyer In A Can™ disappears, it slips you its business card with its private incantation line. While you possess the incantation, you can summon them forth for future negotiations…at 1,000 gold a minute. Please recycle the can after use.